Posted April 21st, 2015 at 4:51 pm. 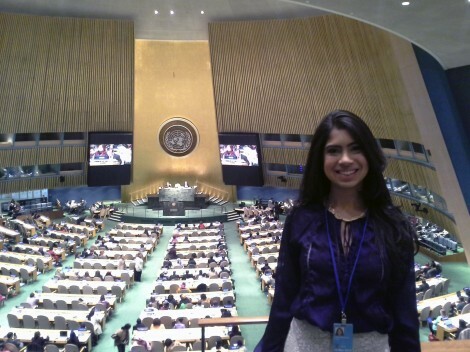 Though only a first-year student, Larissa de Paula ’18 of Brazil is so convinced of the transformative power of women’s colleges she has created the first blog in Portuguese talking specifically about all-women’s colleges in the U.S.
And last month Larissa took her pro-women’s college message to the United Nations headquarters in New York as part of a delegation to the 59th session of the United Nations Commission on the Status of Women. At the U.N., Larissa met with presidents of women’s colleges from around the world. In addition, she met with a World Bank representative for women’s issues and with coordinators of U.N.-habitat. She also got to hear U.N. Secretary-General Ban Ki-moon, former Secretary of State Hillary Clinton, Philanthropist Melinda Gates, and the U.N. Women Executive Director Phumzile Mlambo-Ngcuka. The main focus of the session was on the Beijing Declaration and Platform for Action, including current challenges that affect its implementation and the achievement of gender equality and the empowerment of women. The Commission undertook a review of progress made in the implementation of the Beijing Declaration and Platform for Action, 20 years after its adoption at the Fourth World Conference on Women in 1995. The review (Beijing+20) also included the outcomes of the 23rd special session of the General Assembly, the first five-year assessment conducted after the adoption of the Platform for Action, which highlighted further actions and initiatives. The session also addressed opportunities for achieving gender equality and the empowerment of women in the post-2015 development agenda. Larissa plans to major in political science and international studies with a growth and structure of cities minor.